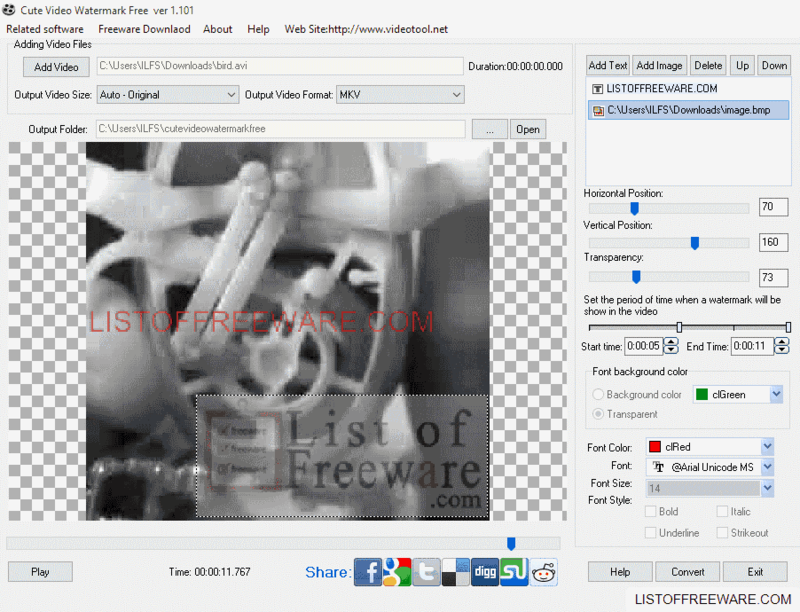 Here is a list of best free software to watermark videos for Windows. Using these free video watermarking software, you can add text watermark and image watermark to videos easily. Some of these freeware also let you batch watermark videos. The watermark can be set at any location and different parameters can be set for watermarking. These video watermarking software can be used to set watermark duration and watermark timing. Apart from these, you can also set text font, text size, watermark transparency, text format, etc. These can also be used to make several other changes to videos, like: crop videos, resize videos, set borders, audio conversion, etc. Note: Maintain a backup of the original file while adding watermark, as the process of adding watermark is irreversible. Out of these software used to watermark videos, I like Cute Video Watermark Free the most. It is due to the fact that, it is quite easy to use and requires no extra effort on your part. It has a number of features that let you add both text watermark and image watermark at the same time. Watermark can be applied at any location that you wish by making use of sliders. You can also set time duration for which different watermarks are to be displayed. A preview of video with watermark can also be seen. You can also check out the list of best free Software to Watermark Photos For Windows, Software To Add Watermark To PDF Files, and Video Editor Software. Cute Video Watermark Free is a simple software which you can use to add text and photo watermark to videos. Text and video watermarks can be applied at the same time and you can also specify at what time which watermark is to appear and disappear. Using sliders, the position of watermark can be set along with timing of watermarks to appear in both the cases. In text watermark, you are provided with extra option to change the font color, font, font size, font style, font background color, and font background color transparency. Open Cute Video Watermark Free and add video. Add text watermark or image watermark as per the requirement. Set its location and timings using the respective sliders. Choose the output format, output folder, click on Convert button and you are done. It can also be used to convert video into various formats, like: 3GP. AVI, FLV, iPod, MKV, MOV, MP4, OGG, PSP, RM10, RM20, SWF, WMV, WEBM, M1V, and M2V. Windows Movie Maker is a freeware offered by Microsoft that can be used to create movies using audio files, video files, or images. You can also add text that can act as watermark for video. For this, you have to make use of the Caption option. Different caption parameters can be changed, like: font, text size, outline size, and outline color. You can place it anywhere on the screen by simple drag and drop. You can also apply effects to add animated watermark. Start time and Text duration options let you control the time and duration for which the watermark is to be displayed. Video can be saved locally in various formats for different devices, or can be shared online on OneDrive, Facebook, YouTube, Vimeo, Flickr, etc. Using 6.0 Version Of Windows Movie Maker, you can add image watermark to video as well. Click on the button Windows Vista Logo Locator. Chose the position, screen size, logo, enter logo name, and name of title. Copy the code generated below and paste it in notepad. Save it as XML file. This can be done by typing .xml after the name of the file while saving it. Paste the XML file in the AddOnTFX folder and move the image to be watermarked in the same folder. Add a video to add watermark and go to Titles and Credits> Title on the selected clip. A new window appears where you can enter a Title. Click in the title text section, and simply press the Space Bar (to enter space). Now click on the button: Change the title animation. A list of animations appear along with the XML file that you added for watermarking video. Select and apply the changes, and you are good to go. Finally save the video as AVI or WMV locally. It can also be shared via email or burnt on CD. 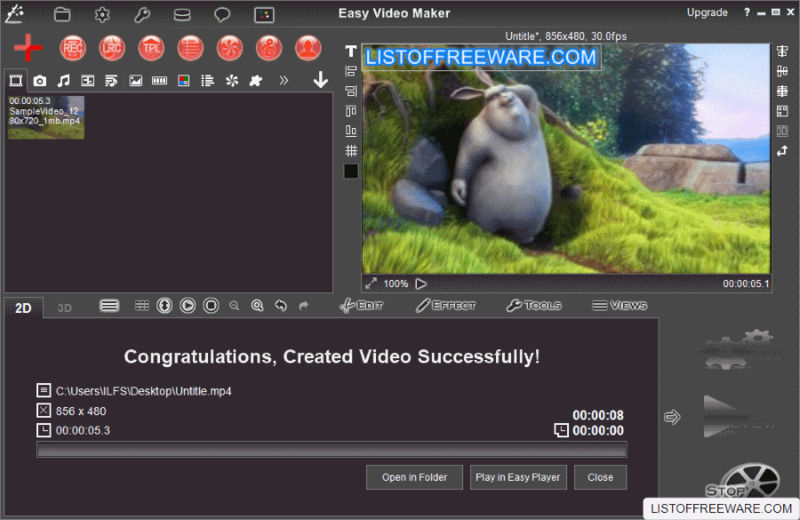 Easy Video Maker is a free video editor that can be used to watermark videos. There are certain personalization options that let you choose location, font, size, layout, and text style. Transition and effects can also be used if required. The preview of the video file can be watched with watermarks. It can also be used to batch watermark videos by adding image watermark. If required, motion effects can also be applied to watermark. 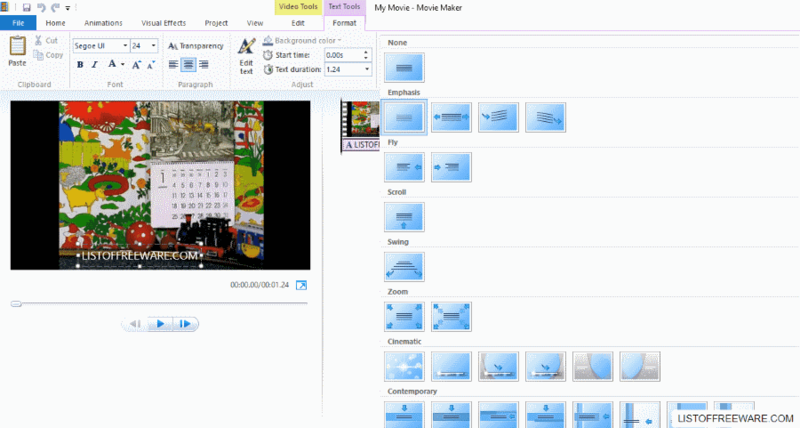 Open Easy Video Maker and go to Function Modules> Make Videos in Batch. Add the files which are to be watermarked. Click the button, Add Watermark/Logo Onto All Checked Videos. Add the logo file, set position, logo size, transparency, etc. You can select object motion from predefined motions or you can add your own custom motion. Watermarked video can be previewed. Click on the RENDER button, specify the file location, and the watermarked video is saved to the desired location. Some other actions, like: crop, split, join, etc. can be performed in batch on video files using this software. The video thus created can be saved as MP4, AVI, MOV, WMV, ASF, MPG, FLV, or MKV. Any Video Converter (AVC) is free software to batch watermark videos with text watermark or image watermark. It is mainly used as a video converter that can convert various video files to different formats and for different devices. Text and image watermarking options have their own set of parameters to be changed. In case of text and image watermark, you can change transparency, location, etc. Text size, font, layout, font color can also be changed for text watermarks. You can also preview the watermarked video. In case of batch watermarking, for each watermark to be applied, you have to set watermark options separately in each case. Open AVC and select the video/videos to be watermarked. Go to Add Effects>Video Watermark, then choose whether to add text watermark or Pic watermark. Specify the text/image to watermark. Crop, rotation, and other effects can also be applied to a video along with watermarking. Repeat the process with other added video files (in case of batch watermarking). Click on Convert Now! button and the video(s) will be converted and saved to the specified output folder. 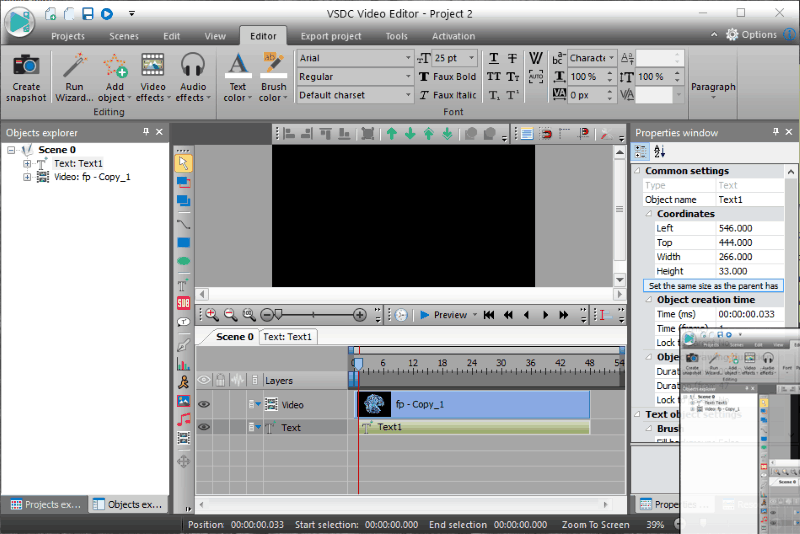 VSDC Video Editor is available as a freeware version that can be used to create and edit video files. It can also be used to create videos by either creating slideshow, importing media content, or capturing screen. Use it to add watermark to the created video files or existing video files. Add either text watermark, image watermark, or both to video files. There are some other effects that can be added to video files. A preview of the output can also be watched. Open VSDC Video Editor, create a new project and import the video that you want to add the watermark to. Add text watermark by clicking on the button Add Text. Change its properties, like: color, size, location, transparency, font, timing, duration, etc. Add image watermark by clicking the button Add Image. Change its properties, like: size, transparency, location, timing, duration, etc. Apply some other effects if required, like: motion, sound, animation, etc. Save the project as VPROJ or export it for various devices in different formats, like: AVI, MPG, MOV, WMV, MKV, RM, SWF, or FLV. FFmpeg is a cross platform command line tool to add watermark to videos. You need to have a pretty good idea about the commands and how they are used to make use of this feature. It can be used to add text watermark and image watermark on videos. Using commands, set location, movement, rotation, etc. for watermark. The watermark can also be added at a position which is not covering the video. You can also animate the watermark image or text. Move the video to be watermarked in the bin folder of FFmpeg. Its located where you extracted FFmpeg. If you want to add image watermark, put it in the same bin folder. Type the following commands to watermark video. above command adds image.bmp as an watermark to flame.avi and saves it as flame1.avi. above command adds watermark in the center of video. above command provides animated watermark. It can also be used to encode, decode, record, convert, and stream audio and video. For more commands, check out the documentation pages of FFmpeg. VirtualDub is a good video editor freeware to process videos and make numerous edits to it. You can also use it to add image logo watermark to video files. Watermark image can be placed at 9 different predefined locations on the video with some minor offset adjustments. You can also set image watermark’s opacity. Preview video before saving it. Various other editing can be done on videos with this freeware. Open VirtualDub and add the video to be watermarked. Go to Video> Filters> Add> logo. Select the logo image to be watermarked, then set its opacity, justification, and offset. Play with the advanced options if you know what you are doing. Apply some other effects if required. Finally save the video file in the required format. You can also use it to perform some advanced editing as well, by making use of plugins or otherwise. AVI ReComp is a freeware that can be used to add watermark to the AVI files. The final output is also saved as AVI. Here you can add logo as watermark. Set your watermark’s position, time duration, start time, fading, and transparency. Apart from that, it can also be used to add subtitles. You can also use it to crop, resize, perform audio conversion, and add borders. A preview of video can also be played. Open AVI ReComp, then select the input and output AVI file location. In the Logo section, Enable the logo function, then load logo file. Change the settings to specify time, position, and duration for the logo to appear. Preview and add the file to Queue for processing. Click on Start button to add image watermark. 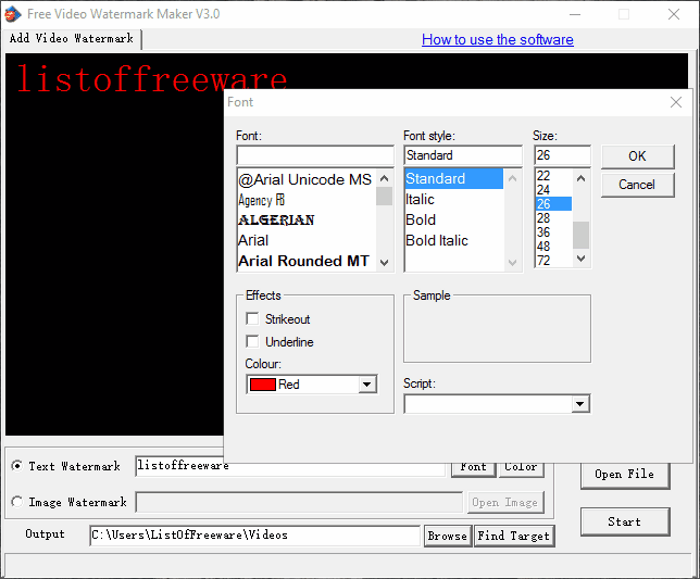 Free Video Watermark Maker is a simple video watermarking freeware. Both image and text watermarks can be added to video files. The watermark can be placed anywhere on the file. In text watermark option, you can change the font, font style, font size, text color, etc. Open Free Video Watermark Maker, and select the file to which you want to add watermark. Select the option to either add text watermark or image watermark, and set the watermark parameters. Select the location of the watermark and preview the output. Select the output folder and click on Start button, then watermarked video is saved to the desired location.